The novice quest chock-full of Pirates of the Caribbean references! Recently, ships ferrying supplies to Ashdale have returned with their cargo still aboard, reporting that the island has apparently been deserted. Gudrik is eager to investigate the mystery, but he is too old to do so himself – he needs someone to travel the island and find out what is wrong. Speak with Gudrik in his home south-west of the Taverley lodestone. To begin, go to Gudrik's house, located next to the Dungeoneering tutor south of White Wolf Mountain. Speak to Gudrik, who has some bad news. A mysterious aura hangs over the now-deserted island. Accept the adventure and board the ship west of Gudrik's house. Note: If you die from here on, you will not lose any items and will respawn at approximately the same spot. If you leave, you will also return to the point you were last. Once you get to Ashdale, head north into town and talk to Lucy. She should be fairly easy to spot because she will be the only yellow dot on your map. After you have finished talking to her, climb into the sewers behind her house. Run east and then north until you reach a large, open room where you will be attacked by a Crassian Scout. Its combat is scaled to yours, so expect a somewhat difficult fight regardless of your combat level. The Crassian Scout attacks with range and melee and is capable of stunning you. Use the freedom/anticipation abilities to free yourself from stuns and to prevent getting stunned. When you kill it, it will drop a minnow that heals 200 life points. After this, run in the northwestern direction until you reach another open room. Mama Crass must be having lots of babies because here you will be attacked by yet another Crassian Scout. Expect this battle to be like the first fight. After beating the second scout, climb the ladder out of the sewers. Walk or run south and then west into the town square where you will witness a cutscene focusing in on a particular building. This is either a way for the game developers to highlight the architecture of the town, or a way for them to hint there is something sketchy about the place. We will go with the latter. There will be another two Crassian Scouts eagerly waiting for you in the square. Either face them both or face them one at a time by inching slowly into the square to attract only the attention of one. Kill them both and walk past the gate they were guarding. Walk into the ominous Seastack House and, if you'd like, take the journal from the table. Inspecting the bust results in a stairwell forming under a part of the floor. Climb down these stairs. Apparently, word of your deeds has not spread through the Crassian ranks because two more Crassian Scouts are found waiting underneath the house. Again, you will have the option of killing only one at a time if you slowly inch forwards. After killing these, walk east to find a room with five barrels. On the eastern side of the room you will find a valve outer wheel , a valve inner wheel , and some pitch . Take these. Use the valve inner wheel on the valve outer wheel to create a valve wheel . Repair the pipe leading to the wall and repair the socket on the south side of the central barrel. Now you must channel the water to the door. First, turn the valve of the barrel filled with water and continue doing this with every barrel that fills with water until it reaches the door. After this is completed, the door will swing open. Go through the door to find breeding pods and three more Crassian Scouts. There is also a chest here containing 125 coins and an uncut sapphire. After killing and looting, walk through the broken barrier in the southeast corner of the room. There is a Crassian Warrior here. If you are seen by the Crassian Warrior, AKA "Crassius Clay," you will die in one knockout hit. If you are killed by one, you will restart at approximately the same position without losing any items. In fact, letting yourself get killed like this might be a good way to restore your life points. While the Crassian Warrior is not looking, run and pull the lever on the southern wall. This will kill the Crassian Warrior. Run through the broken barrier to your east to find another Crassian Warrior. Again, pull the lever on the northwestern wall to take care of this problem. Avoid the warrior in the next room, go into the one after that, and pull the lever on the north side of that room. Proceed into the next room. In this room there is a lootable chest with 500 coins and three uncut sapphires. Once again there are Crassian Warriors, so you must avoid being spotted by them and reach the lever on the northwestern side of the room to kill them. You'd think by now they'd realize walking over booby traps is a bad idea! Walk into the next room to find two Crassian Scouts and a chest that contains 132 coins and an uncut emerald. After killing the scouts and plundering, proceed into the ship. Here you will be attacked by four tentacles. The tentacles hit about one tenth of your maximum life points. Stand under one and kill it. After that, kill the rest using a ranged or magic attack from a safe distance to take no damage; however, you will incur the wrath of something bigger. 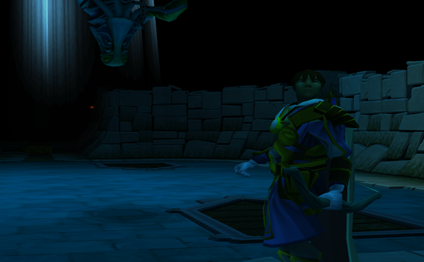 Agoroth is capable of attacking with several different attacks. He has a basic melee attack that uses his claws. He will be able to shoot a jet of water that will deal heavy damage if you are caught in the middle of it. Avoid this attack when possible. He may also spawn droplets similar to the dungeoneering boss Har'Lak the Riftsplitter, summoning portals which will also inflict heavy damage if you are caught in the middle of them. This attack will hit one-sixth of your maximum life points, so you should avoid it as well. In addition, the four tentacles have regenerated and will continue to damage you. To avoid all attacks, run into the back of the ship (opposite Agoroth). You will not be able to attack Agoroth here, but this is a good place to eat and recuperate. After defeating Agoroth, you will appear in the town square in front of a joyous crowd. Talk to Lucy to head back to Taverley. Head back to Gudrik who seems very thankful that the creatures were stopped. And they would have gotten away with it, too, if it weren't for you meddling kids! 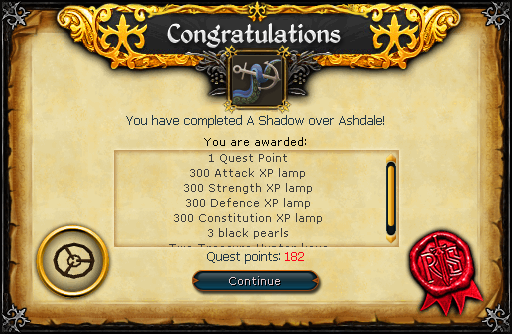 After completing the quest, you may return to Ashdale. While in town, be sure to activate the lodestone for future access. In the northwest corner of the island, there is a cave which leads to the dungeon you fought your way through in the quest. Here, there are level ten Crassian Scouts and Crassian Warriors, ideal for low-level training. You may also search through the Dead Man's Chest to fight Agoroth again. After you kill Agoroth, search the chest again to obtain more black pearls. Members may receive two and freeplayers may receive one. This can be repeated once a week. The Dead Man's Chest can also be used as a bank. The journal obtained during the quest gives some back story to the plot.